Around two years ago in Sept. 2008 I first figured out My Current Asset Allocation at the time. I then posted a follow up on May 2009. Its been a while so its about time that I revisited that topic and look at our asset allocation again. I figured out the asset allocation by using the net work information that I collected at the end of Nov. 2010. The biggest difference is that the real estate has gone down. As you might have guessed the value of our real estate has gone down. Plus our other assets have increased so the % shifts. The amount in stocks has gone up both because we've put more money into stocks via Roth IRA investment and our equities have performed well. Quick definition of the different categories. Real Estate -We own our house and some rental properties. We have a mortgage on our house and a couple of the rentals. The rental values are the equity after the mortgages. We have about $147k equity in our house and about $208k equity in our rentals. Cash - This is cash assets held in checking accounts, savings accounts and retirement plans. Pension plan - I have an employer provided pension plan. That money is managed by my employer so I have no say in its allocation. I'm 100% vested in the pension. 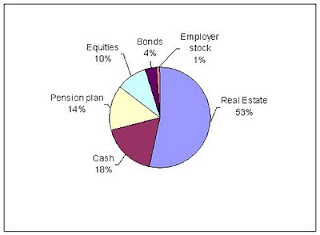 Equities - These are mutual fund and stock holdings in our 401k and IRA retirement plans. These investments are relatively high risk. Bonds - A portion of our retirement funds are invested in stable income assets. Employer Stock - I sold off my employer stock shares. Now the only stake I have in my employer stock is some old stock options that are work a bit right now.